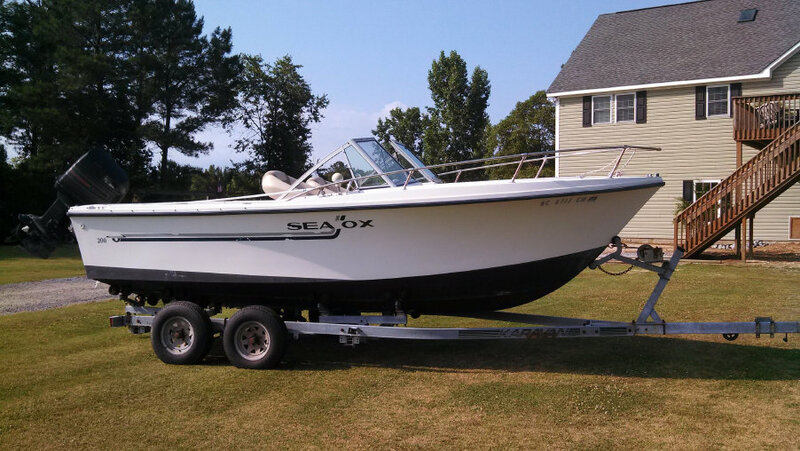 1991 Sea Ox D200 20 foot boat. It is powered by its original factory installed OMC 225 HP SeaDrive motor. The boat was bought in 2004 and has been stored in a covered boat lift located on North Creek off the Pamlico River near Bath, NC. The boat is in very good condition for its age. Since the boat was bought there has been several upgrades -- two seats, built in tackle box, new hydraulic steering, new OMC engine control and control cables, kicker motor bracket. Electronics are dated. VHF radio and antenna are good. The hull is sound with no known issues. The boat may be purchased without the trailer. If the buyer does not want the trailer, the price will be reduced by $500. I believe that the boat is realistically priced, but I am definitely selling the boat, so all offers will be considered. While Sea Ox is no longer in business, they were known to build a high-quality boat. It was founded by former Grady White executives and was also built in Greenville, NC.